It is a truth universally acknowledged that a newly-married woman in possession of a good kitchen must be in want of a KitchenAid. Actually the newly married has nothing to do with it but we finally moved to a house where appliances don’t have to prove their worth by multi-tasking to earn valuable counter space (therefore hello enormo coffee grinder…) and my mother in law brilliantly ordered this for us. 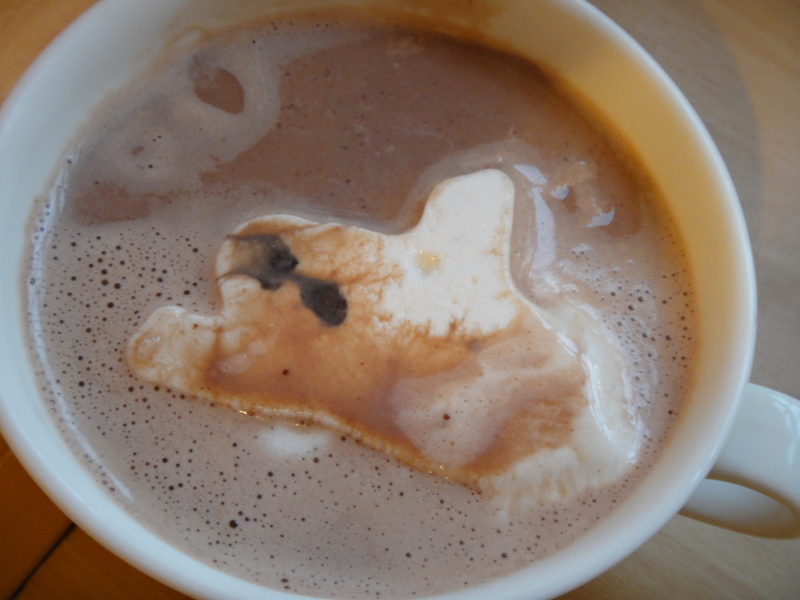 I worked from the recipe in Matt Lewis and Rene Poliafito‘s Baked book, after seeing them float Titanic-capsizing chunks of fresh vanilla marshmallow into the hot chocolate they serve at their Red Hook bakery last year and being unable to forget them! Make sure to be particularly pernickety about your mise-en-place for this. Even attempting to be rigorous, I had a few things that I needed to dash and find. 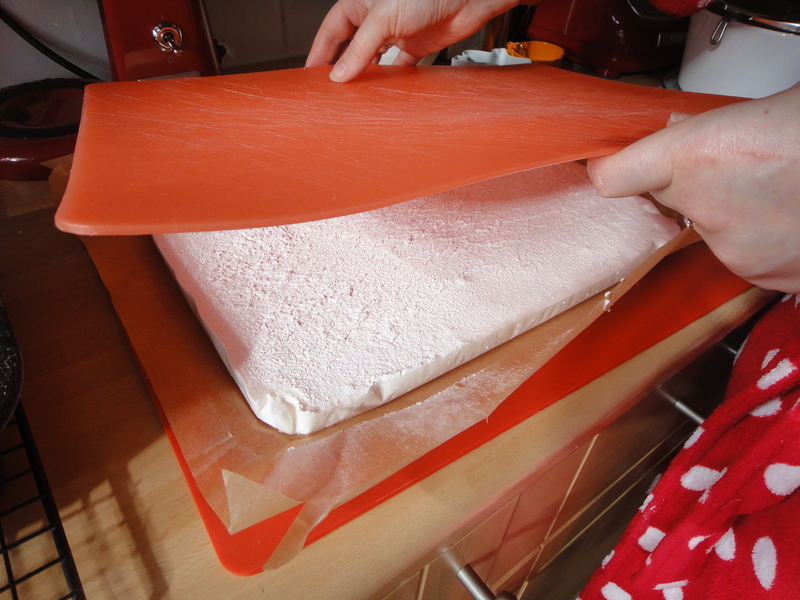 Line the tin generously with parchment and clingfilm as you’ll need to grasp it to lever the glorious slab out when it’s set. Generously line the tin with clingfilm, followed by parchment and either use spray oil to grease, or brush the parchment with oil using a pastry brush. Leave the gelatin in a bowl of cold water to soften (make sure the bowl you use will fit snugly on top of Saucepan B in double-boiler fashion for later). In Saucepan A, stir together ½ cup of corn syrup, ½ cup of water and all the sugar. 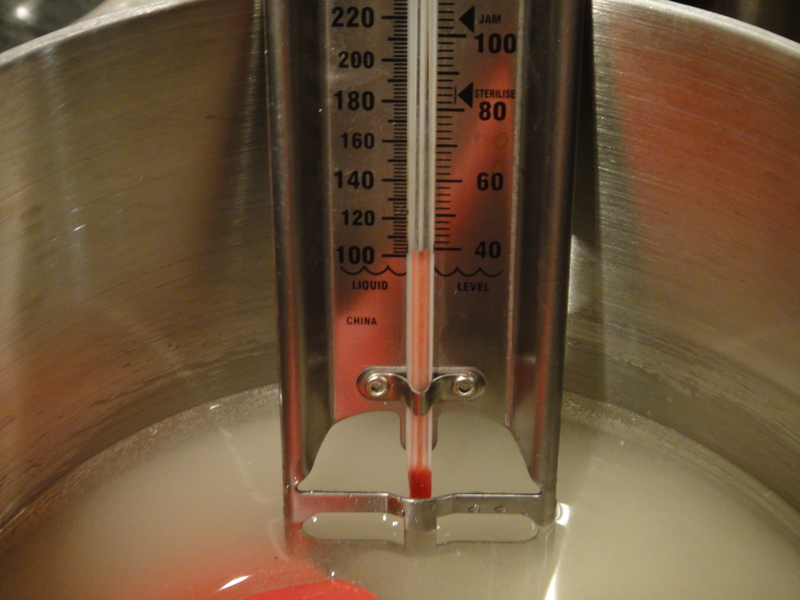 Don’t splash it up the sides and make the pan is deep enough to accommodate your sugar thermometer’s bulb! (I had to change pans). Put the other ½ cup of corn syrup in the stand mixer. 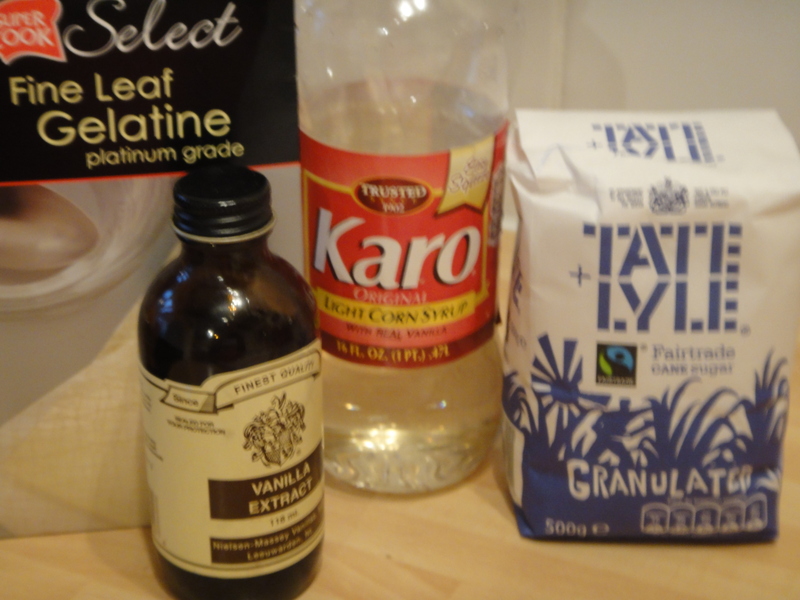 Pour that gelatin into the stand mixer with the corn syrup and start whisking on low. Skip promptly back to Saucepan A and take it off the heat at “Soft Ball” stage, about 235F. Bring to the mixer, turn the speed to medium then very carefully pour the contents of Saucepan A into the mixer bowl. Then turn the speed to medium/high for five minutes until you see it majestically fluff and expand. Quickly add the vanilla and salt, then give it another minute on high. Make sure your pan is ready beside you and pour the marshmallow in and spread out. Use the spatula if you must but gently tilting the tin works too. Sprinkle the top with sugar. Leave for at least six hours or overnight before attempting to cut it. Lift it out of the tin by grabbing the parchment. Flip it over using another board so you can also sugar the bottom. 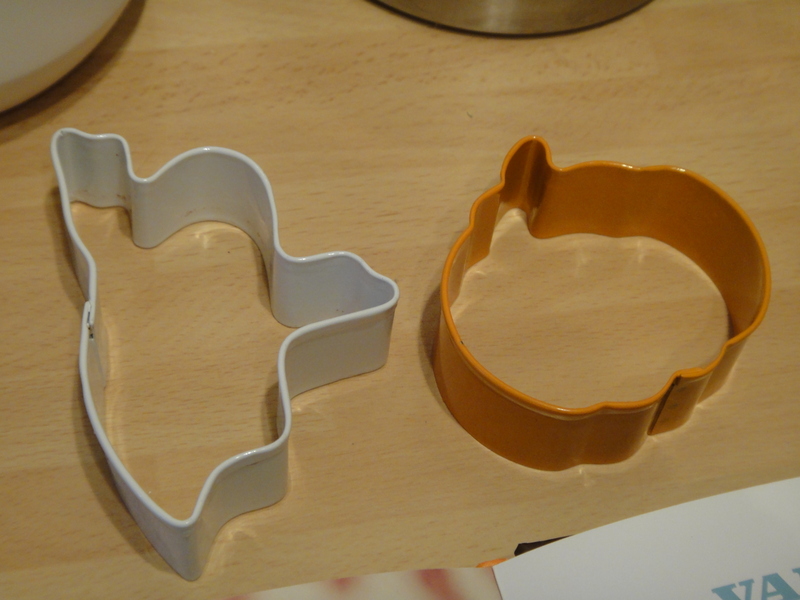 Either cut into large squares or use cookie cutters to cut specific shapes if you like. Toss them in the sugar and cornflour mix to coat them and minimize sticky fingers! I would say that while it’s not complex to make marshmallows, a stand mixer does make it easier and you have a lot of steps to get through at once, around the critical sugar-boiling stage. Also – hell of a lot of washing up, of sticky gloopy things. But I do think it’s worth it. So cute! 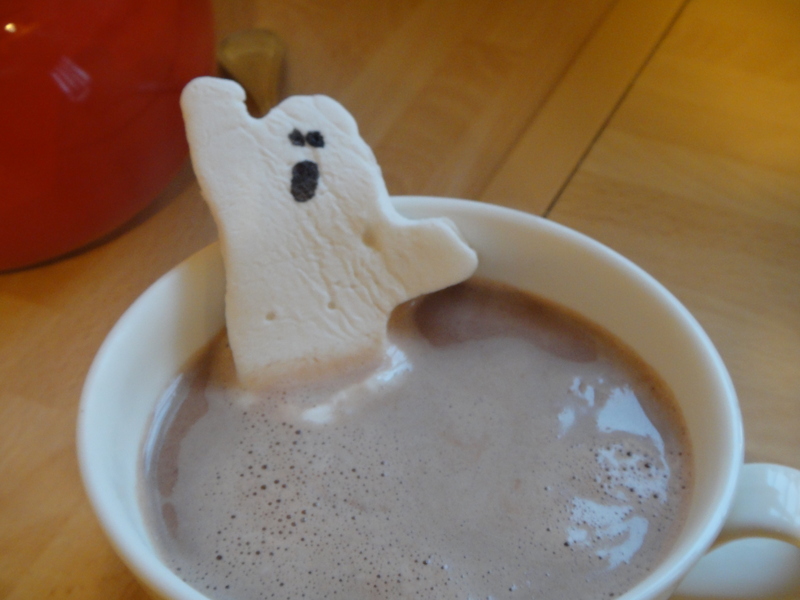 Poor little marshmallow ghost…. You have a very nice mother-in-law and seeing as we have the same shiny red toy I now feel that I have to attempt to make these for my kids. Very very cute! I want one, they’re adorable! Totally AWESOME! A must try. 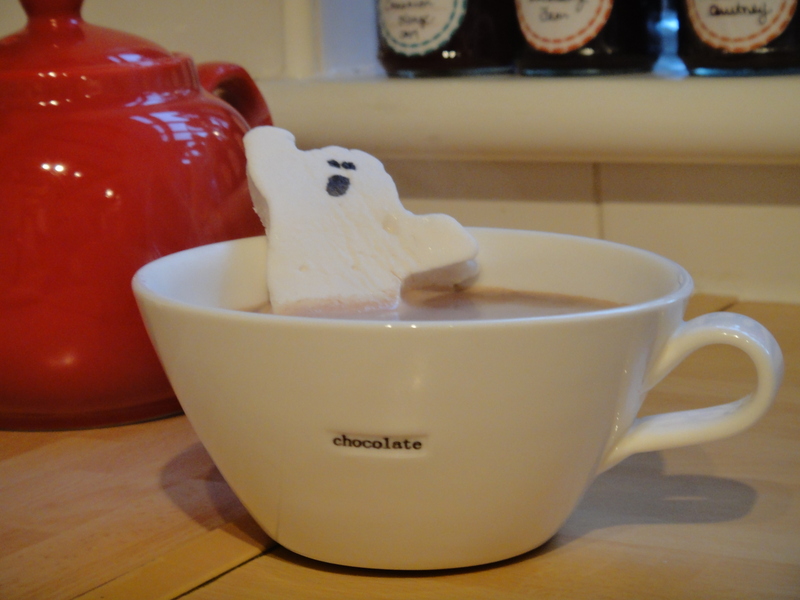 I LOVE it…those ghost marshmallows looks so yummy! This is one to try out if (when) we get a stand-up mixer. Mrs GW s a marshmallow fiend and I might be partial to the wee one or two… D’you think these would work staked and toasted over a fire? Thanks guys! 🙂 Really quite tempted to make them again now. 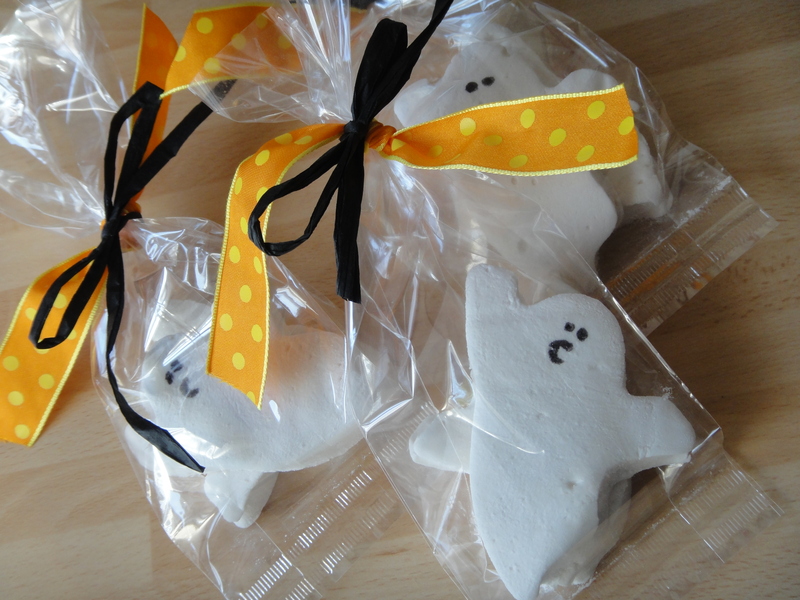 Skull shaped ones for the Day Of The Dead…? Mr GW – they’re reasonable robust though the longer you make them, a la the ghost shape, the more propensity to flop. But if you used a deeper tray you could make them chunky and square?